Mad Men’s Jon Hamm is in talks to co-star in Marjorie Prime, a film adaptation of the award-winning play by Jordan Harrison. The play, a 2015 Pulitzer Prize finalist, tells the story of Marjorie, an elderly former violinist with arthritis. As her memories begin to slip, she seeks out a service that provides holographic renderings of deceased loved ones rendered how their loved ones want to remember them. Marjorie spends her days with her daughter, her son-in-law, and a holographic copy of her deceased husband Walter, but she wants hologram-Walter to appear as he looked in his 30s and 40s, not as an old man, because Marjorie knows what’s up. 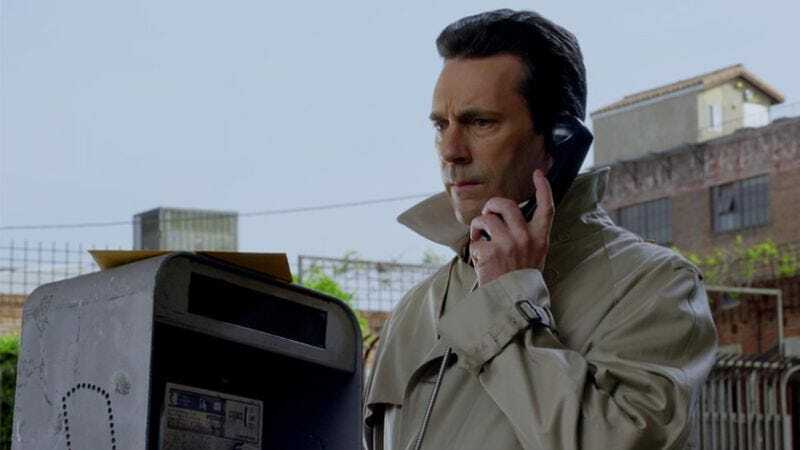 Hamm is being eyed for the role of Walter, because who wouldn’t want their own hologram of Jon Hamm to keep them company in their dying days? The movie is described as a science-fiction dramedy, which hopefully means Hamm will be able to show off his impressive and sometimes overlooked comedic chops, seen most recently on Unbreakable Kimmy Schmidt and Wet Hot American Summer: First Day Of Camp. Hamm was recently nominated for an Emmy in the Outstanding Lead Actor in a Drama Series category, his last chance to win for his work on Mad Men. Michael Almereyda penned the adaptation and is set to direct. Almereyda also wrote and directed Experimenter, which premiered at Sundance this year. Production on Marjorie Prime is slated to begin in October.